The day-to-day operations of public venues are becoming increasingly complex as communication system technologies advance and IT managers are tasked with system integration. Whether overseeing a hospital, shopping center or sports arena, public safety and communication is an increasing priority for facilities, risk and IT managers. Timely and clear communication is paramount when informing and communicating with building occupants. One of the most assured ways to achieve success is with a robust, reliable critical paging system that clearly informs occupants of the messages they need to hear, regardless of the installation size or configuration. Whether expanding, retrofitting or planning new construction, having a flexible, scalable system will ensure success by providing safety and information to those throughout the facility. 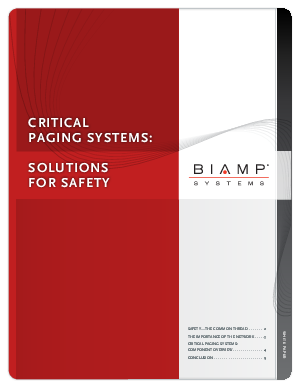 This whitepaper describes some of the most common requirements and functions of modern paging and emergency communication systems, the components that make those functions happen, and ways to safeguarding against failure of both individual units and the entire system.